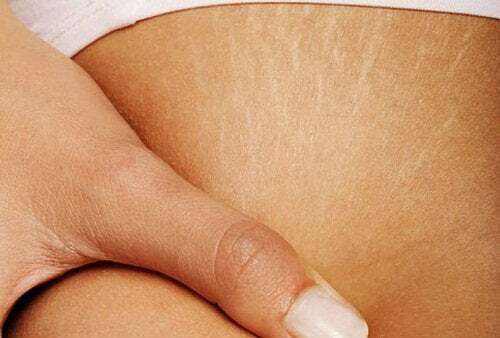 If your stretch marks still have a reddish or purple color, you can eliminate them. If they’ve already taken on a whitish tone, you can minimize their appearance but not make them disappear. If there is one thing that’s unsightly, it’s stretch marks. And there’s no doubt that the appearance of our skin is something that concerns everyone. Fortunately, there are natural ways you can help to eliminate or reduce stretch marks. For those who don’t yet know what stretch marks are, they’re the result of the breakage of elastic fibers in the skin. When the skin is stretched, fibers that have less elasticity are broken and cause stretch marks to appear. They are especially common in women during pregnancy. At first, they are pink or red in appearance, then they turn white. Stretch marks essentially represent the separation of the skin. They can appear without warning and are usually painless, although sometimes they might be accompanied with a slight tingling sensation. To prevent them, it’s essential to keep your skin well hydrated. This will allow your dermis to be more elastic and to stretch without causing the breakage of any fibers. If we want to eliminate or reduce stretch marks then we need to bear in mind that not all stretch marks are the same. First of all, there are stretch marks that are caused when the skin is stretched by sudden changes in weight. The second type includes those that are formed during puberty. This is a crucial time of growth when your body undergoes important changes. 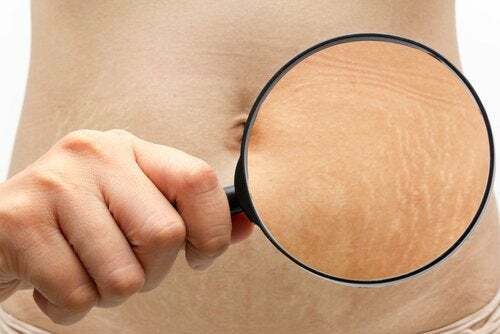 Hormonal disorders during puberty can also lead to the formation of atrophic stretch marks that may be irreversible if they’re not avoided. The third type includes those caused by pregnancy: these appear especially in the breasts, abdomen, hips, and buttocks. They usually form during the sixth month of pregnancy when the skin begins to tighten. Finally, stretch marks can also appear as a result of excessive exercise or physical strain that modifies the surface of the skin through muscle building or tension (this is the case with athletes, dancers, etc.). Is it really possible to eliminate or reduce stretch marks? Lotions and other products that are rich in vitamin A, such as rose hip oil, are ideal for fighting stretch marks. 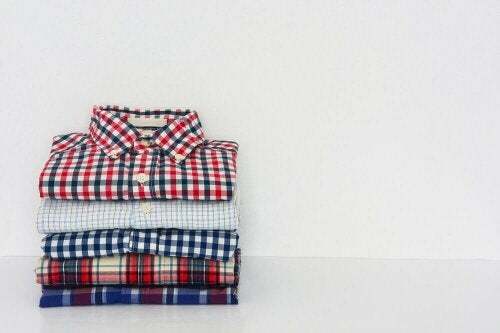 These usually have regenerative properties and are safe for daily use. Whether you choose a cream or an oil, they will noticeably improve your stretch marks. Vitamins A and B will help your body regenerate its connective tissues and produce collagen, so they’re great for improving stretch marks. Exfoliating treatments can help improve impurities throughout the layers of the skin, making this an ideal way to resolve those annoying stretch marks. Mandelic acid (found in bitter almonds) and glycolic acid (extracted from sugarcane) can provide excellent results. If you want to try some deeper treatments, diamond tip dermabrasion is the most effective. Laser treatments are another option to help you eliminate and reduce stretch marks. Due to the cost, however, not everyone is capable of taking advantage of them. Although this treatment is not natural, it provides excellent results, and that’s why we’re mentioning it here. Mesotherapy is the ideal treatment for stretch marks that have recently appeared (those with a pink or reddish color). It consists of injecting certain compounds into the area (such as hyaluronic acid, antioxidants, vitamins, minerals, or amino acids) to promote cellular regeneration and restore the skin. You should talk with your doctor about the suitability of this particular practice for you, and always follow the advice of a professional. Horsetail grass can be used for more than just fighting fluid retention – it’s very effective for stretch marks, thanks to its silicon content. 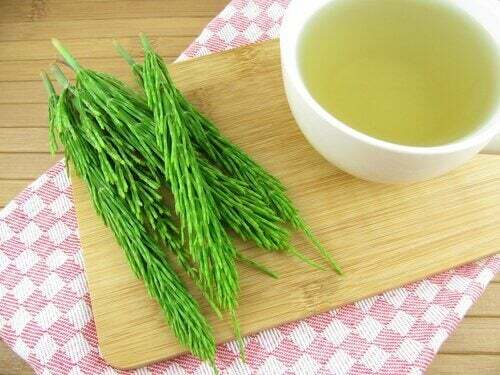 Firstly, combine the rubbing alcohol with the horsetail grass and lemon juice in a dark container. Then leave it for one month. After that time, dilute it with two cups of water. Massage this mixture into the areas affected by stretch marks two times a day. You’ll really notice the difference!